A classic collection in strong 245g/m² polyester and cotton - that makes this range extremely tough and durable. Tranemo 1140 40 Bib & Brace is very comfortable to wear, this range is ideally suited for the industrial and service markets. Most of the garments are also designed to reduce risk of scratching sensitive surfaces with plastic zips and hidden buttons. Tranemo 1140 40 Bib & Brace is ideally for manufacturing and the automotive industry. Tranemo 1140 40 Bib & Brace light but strong Fabric: 65% polyester 35% cotton 245 g/m². This coverall is produced in a strong and durable polyester/cotton fabric, with a brushed inside for greater comfort. Comfort Plus boiler suits are ideal for a wide range of different workplace applications: from manufacturing to warehousing to logistics. Two chest pockets with flap and stud closure. Tranemo QE0319 Polycotton Coverall made using 65% Polyester 35% Cotton fabric. Bib 'n' brace in Canvas/Panama fabric with adjustable braces and HTPA-reinforced kneepad pockets. The garment has aluminium look rivets and buttons, embroidery, reflective and two coloured reinforced fabric. Adjustable braces with fixed lock closing, Adjustable waist with belt loops. Chest pocket with flap, Inside safety pocket with zip. Left cargo pocket with flap and keyring holder, mobile phone pocket, pockets for small tools and pencil holder. Reinforcing fabric, HTPA Dobby, 100% polyamide with extra high durability, 260 g/m². High-Visibility overall in a durable material with ripstop for enhanced tear strength. High-Visibility boilersuit triple stitched for ultimate strength. Concealed two-way zip and press studs, Chest pockets with flaps and keyring holder. Mobile phone pocket on left sleeve. Elasticated waist band and actionback for free movement. Side pockets with hidden access, Hip pockets, Ruler pocket with pockets for pencils. Kneepad pockets with 2 height placements. Fluorescent fabric: 54% cotton / 46% polyester, twill with ripstop, 260 g/m². Grey fabric: 65% polyester / 35% cotton, twill with comfort finish, 300 g/m². Tranemo Hi Vis 4810 44 92 Coverall conforms to EN471 Class - 3 safety standard. Tranemo 2100 Comfort Light Men Work Trousers, Size - 32"
Lighter weight cargo trousers with anti-scratch finish. Cargo pocket with flap, mobile phone pocket and keyring holder. Tranemo 2100 Comfort Light Men Cargo Trousers fabric: 65% Polyester 35% Cotton 245 g/m². Available in size 32" regular only. Triple stitched for ultimate strength. Side pockets with extra strong lining. These trousers include hip pockets, one with flap. Ruler pocket with tool pocket on the back of the leg. Cargo pocket with flap and mobile phone pocket, provides extra storage. Double reflective bands on bottom leg. Tranemo 2920 Klopman work trousers made from 75% Cotton / 24% Polyester / 1% Grid Antistatic. Comfort finish. Classic craftsman's trousers from Tranemo. Multi pocket work trousers featuring Tool front pockets and Hip pocket with flap. Kneepad pockets with two height positions. Double ruler pocket and Cargo pocket with mobile phone pocket. 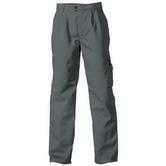 Tranemo 7400 Craftsman Trousers with Stain resistant (shiny) finish. Tranemo 7400 Craftsman Trousers fabric: 50% nylon / 50% Cotton, 245g/m². Tranemo 1120 40 Comfort Lite Navy Work Trousers are lightweight scratch resistant trousers. They include side pockets & hip pockets for additional item storage. Additional tool pockets include a Cargo pocket with flap & mobile phone pocket with a key ring holder to keep items safe. Tranemo 2100/1120 Comfort Lite Navy Work Trousers are made from 65% polyester, 35% cotton, 245 g\m². Multi-function work trousers with HTPA lining in tool pockets. Large front pockets fitted with nail pockets. Double cargo pockets with mobile phone pocket. Kneepad pockets in HTPA with two height placements. Tranemo 7330 Premium Plus Mens Work Trousers Fabric: 65% polyester / 35% cotton, twill with comfort finish, 300 g/m². The trousers are produced in a strong and durable polyester/cotton fabric, with a brushed inside for greater comfort. Triple stitched for ultimate strength. Roomy side pockets with extra strong lining. These trousers include hidden hip pocket with button closing. Additional comfort with Adjustable waistband and Double buttoned waist. Tranemo 2930 50 work Trousers are made from 65% polyester / 35% cotton / 300g/m² fabric. Comfort Plus garments are ideal for a wide range of different workplace applications - from manufacturing to warehousing to logistics. Roomy side pockets with extra strong lining. 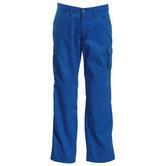 Tranemo 2700 28 Cargo Pant is suitable for both warehouse workers and production staff. Comfort Plus clothing is ideal for a wide range of different occupations - from production to storage to logistics. Made from quality 60% cotton / 40% polyester Comfort Plus fabric, 330 g / m². Brushed inside for extra comfort. Cargo trousers with a perfect fit. Two side pockets, Left leg pocket with flap and zip, extra open pocket. Right leg pocket with flap and cell phone pocket. The Tranemo 5726 88 Arc Flash protection trousers with contrast stitching and Hi-Vis reflective stripes for visibility. Variety of secure storage pockets including hip pockets, two side pockets and a cargo pocket with flaps. 5726 88 trousers from Tranemo including kneepad pockets for knee protection and users comfort at work. Yellow/Navy work trousers has been designed for the wearers comfort. Tranemo 5726 88 trousers approves for IEC 61482-2 CL. 2. and is CE Certified for ARC protection to Class 1 and 11.9 cal/cm2. Tranemo Trouser Navy 2100/1120 40 03 with Knee Pad pockets. Well designed with sspacious side pockets & hip pockets. Additional tool pockets, Cargo pocket with flap & mobile phone pocket with a key ring holder. Comes with additional knee pad protection pockets. 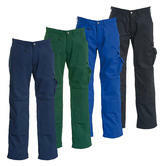 Tranemo 5725 are Flame Retardant trousers suitable for working in areas where flames are sparks are present. These trousers include two side pockets, hip pockets with flap, cargo pocket with flap, keyring holder and ruler pocket. Overall an excellent work trousers that are ideal for everyday use. Tranemo 5725 Trouser Navy Fire Resistant Trousers conforms to: EN ISO 11612: A1+A2 B1 C1 E3 F1, IEC 61482-2: CL.1, EN 1149-5, EN ISO 11611: CL.1 A1+A2, EN 13034: TYPE PB safety standards. Fabric: 48% modacrylic / 46% cotton / 3% aramid / 3% antistatic, 350 g/m². Inherent flame retardant fabric with good protection against molten metal, convective heat and radiant heat. Flame Retardant Nomex multi-function work trousers from Tranemo. Multi pocket trousers with large front pockets and mobile phone pocket. Black 5450-84-03 work trousers with Kneepad pockets, protecting your legs at any situation. Extra durable FR multi function work trousers with contrast stitching and Tool pockets. Nomex material trousers comply with FR EN standards: EN ISO 11612. Colour: Black. Size: 36 inch. Trousers in a lightweight but durable polycotton twill. Scratch resistant construction work trousers. Hip pockets and Roomy side pockets. Tranemo Grey Comfort Light Trousers 1120 Fabric: 65% Polyester 35% Cotton 245 g/m². Cantex is an inherent flame retardant fabric with a cotton finish and weight of 350gsm. The fabric meets the highest demand of protection around hot molten metal’s and is extremely functional in environments where this exposure occurs. With an ATPV of 11.9 and HAF value of 80% the fabric is also very good for protection for users who might be exposed to an electric arc. Flame Retardant trousers with kneepad pockets. Hip pockets with flap, Cargo pocket with flap. Tranemo 5725 88 Cantex Men FR Trousers conform to: EN ISO 11612 A1+A2 B1 C1 E3 F1, IEC 61482-2 CL.1*, EN 1149-5, EN ISO 11611 CL.1 A1+A2, EN 13034 TYPE PB ARC RATING: 11,9 cal/cm². Very hardwearing, three-layered Worker Softshell jacket. 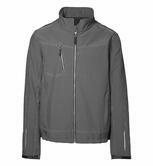 Breathable jacket with a wind and water-repellent membrane. 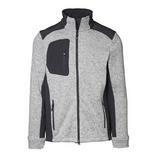 Durable, woven surface and a soft fleece inside. Strong Cordura® reinforcements and great reflector details. Vigorous Vislon zippers in contrast color. Tranemo Softshell Jacket Worker ID 0832 Material: 100% polyester - weight: 320-330 g / m². Tranemo Textil is still relatively unknown ? a hidden gem within the premium workwear industry. It was founded in 1934 and is a 3rd generation Swedish family business. It may have started out to create jobs for local women in Tranemo, but today manufacturing is international, and Tranemo sells over 600,000 garments a year. Tranemo is best known for work trousers, but production now features much more technical polycotton or even CanTex (Canvas blend) garments including heavier garments such as jeans and field uniforms for the military. The Tranemo Navy Comfort Plus Trousers 2820 is one of Tranemos most comfortable and durable pair of trousers. These trousers are manufactured with hip pockets one with flap & double ruler pocket. Tranemo trousers attract very loyal customers: once they switch to Tranemo, the fit is that good and comfortable that customers choose to keep coming back to Tranemo. Can?t find what you?re looking for? Then why not check out our entire Catalogue!